Summary: What is conventional financing for homes? What is specialty financing? Understanding how different types of mortgage loans impact your investment strategy, and deciding optimal financing solutions for your real estate ventures will help in meeting your financial goals. 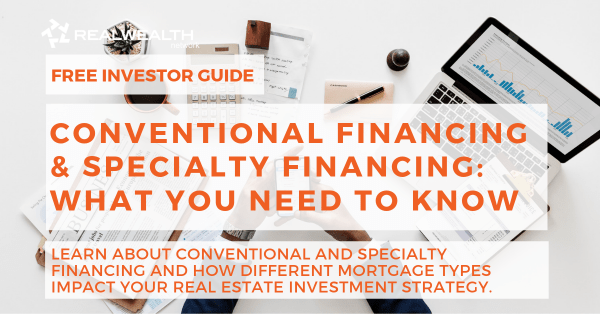 There are three major loan types: conventional, FHA, and VA. With this in mind, you might be asking yourself, “what does conventional financing mean?” Read on to learn more, and discover which mortgage option is right for you, based on your financial goals and investment strategy. There are distinct differences between conventional financing and specialty financing. Before we get into how these different types of loans will affect your return on investment, let’s first discuss, a) the type of loan that you qualify for, and b) how the loan will impact your overarching investment strategy. Conventional financing can be defined as a mortgage that is neither backed by nor insured by the government. This includes government programs like: Federal Housing Administration, Department of Veterans Affairs, or the Department of Agriculture. Additionally, conventional loans tend to have fixed interest rates and terms that apply to the lifetime of the loan. More on that later. A conventional loan is sometimes referred to as a “conforming mortgage.” The reason is that the type of loan conforms with Fannie Mae and Freddie Mac guidelines. These two government-sponsored enterprises buy mortgages from lenders before selling them to investors. Their purpose is to make mortgage loans more widely available. And then there’s conventional or “non-conforming loans.” As their name suggests, these types of loans do not conform with Fannie Mae or Freddie Mac guidelines. Additionally, non-conforming loans typically have a higher loan limit than that of conforming loans. Specialty loan terms are non-conventional loans given to investors. Generally speaking, there is only one specialty loan that is given per property and there is often a 30-year fixed leverage term. The main difference between specialty financing and conventional financing are interest rates. 80% LTV (loan-to-value ratio) purchase. 85% with PMI (private mortgage insurance). 75% cash out refinance. The margins between the 80 percent LTV and 85 percent with PMI can mean the difference between purchasing one investment property and two for some investors. The rates will vary based on credit scores, the investor’s net worth, and several other factors. You can always request that the PMI be removed after a certain amount of equity and / or time is achieved. PMI is also tax deductible on real estate investment properties. Credit Score Requirement is Unchanged. The credit score requirements can vary, however 620 – 650 is typically the minimum score needed for a conventional loan. If you don’t want higher than average interest rates, then you will typically need at least a 740 credit score. Down Payment. Conventional loans typically require a large down payment. While the percentage of down payment needed can vary, generally speaking up to 20 percent is required. The good news is, in recent years some lenders are offering a 3 percent down payment that is based on a low debt to income ratio, a high credit score, and substantial underwritten assets. In many ways, specialty financing is similar to conventional financing, but with a few key differences. 30-year Fixed. Like conventional loans, this is the typical length of a specialty loan. Same Leverage. Oftentimes, specialty loans have the same leverage terms as conventional loans. However, while a cash out is typically capped at 75 percent with a conventional loan, sometimes a specialty loan can receive an 80 percent cash out. Prepayment Penalties Apply. Planning on paying off your mortgage loan early? Penalties may apply and can be equal to a percentage of the outstanding principal balance or equivalent to a fixed number of monthly interest payments. For instance, a 3% fee on a $300,000 mortgage would cost you $9,000. What’s New in Conventional Financing and Specialty Loans? In recent years, there have been changes to conventional financing and specialty loans. Understanding these changes, and how they will impact your investment strategy, are important for applying and selecting the loan that’s right for you. Freddie Mac – 10 spots. There are “10 golden tickets,” or the number of loans/units a qualified individual can receive. Freddie Mac loans are typically more aggressive than Fannie Mae loans. Debt to Income Ratio. The debt to income ratio has increased. 50 percent is now the baseline (in previous years the baseline hovered around 45 percent with compensating factors, such as strong assets). Reserve Requirements. The reserve requirements changed approximately 12 months ago. When qualifying for a loan, in addition to the down payment, there needs to be a certain amount of reserves as either liquid or non-liquid funds. The reserve requirements are now established based on the unpaid principal balance of the outstanding rental property loan. A two percent rate is applied to loan spots 1 – 4, four percent is applied to spots 5 – 6, and 6 percent applies to those in the 7 – 10 loan spot. Additionally, six months of PITI (principal, interest, taxes, insurance) on the rental property. Keep in mind that the primary residence is not counted in the reserve requirements. Let’s say that you have properties 2 – 9 that are rentals, and property number 10 is the subject property. Let’s say that properties 2 -9 have a total of $800,000 in unpaid principal balances. Adding in the appropriate six percent rate on the principal balance, and the PITI, then the reserves needed would be $54,000. Delayed CO Refinance. This is a conventional loan product that allows someone to pay cash for the property, and then turn around and refinance the property for 75 percent of the ARV (After Repair Value). This value was previously capped at 70 percent. No Limits. There is no longer a limit on the number of loans that an individual can receive. Expanded Products. The criteria for qualifying for conventional and specialty loans are very similar. However, specialty loans now have more access to asset based underwrites that let’s lenders calculate the debt-service ratio of the property. This figure is calculated by dividing gross rents by the property’s PITI. It’s important to note that the figure needs to yield a 1.15 or greater in order to qualify. They also don’t like to see loan amounts under $135,000. Finally, the focal point becomes the property, and the secondary focus is the individual. This is ideal for self-employed individuals and can help them to minimize the taxes they are paying on a yearly basis. Rate Margin Improvements. The playing field has leveled between conventional and specialty interest rates. The rates have dropped between 1 – 2 percent difference between conventional and specialty loans. For a more comprehensive breakdown of these recent changes, check out a short video where expert Caeli Ridge, President of Ridge Lending Group, talks about How to Finance Multiple Rental Properties. There is a lot of talk and speculation regarding changes in conventional and specialty financing. Keep in mind that the following predictions are just that, predictions on what will likely occur in the near future. As predictions are never guaranteed, it’s always a good idea to speak with your investing consultant to determine the latest news and updates to both conventional and specialty financing. Up to 15 spots/golden tickets. Some experts believe that conventional financing will move away from 10 golden tickets to 15 golden tickets. Expanded guidelines for self-employed. Expanded guidelines for self-employed borrowers are expected to improve. Expanded Guidelines. The qualifications are expected to loosen and become better for self-employed individuals. More Aggressive Pricing (higher rates). The pricing between conventional and specialty financing is expected to narrow even more. There are several reasons that someone may be denied a loan. Added or undisclosed debt. This occurs when the debt to loan ratio is too high. It often occurs when a borrower fails to disclose all debts. Unseasoned or unverified assets. If assets are not verified or seasoned, they may not qualify and thus result in a denied loan. Loss of job or income. A loss or change of income status can result in a denied loan. This is especially true for individuals who are seeking to move from an employer to “self-employed” status. Undisclosed Properties. Multiple transactions (real estate and otherwise) going on at once must always be disclosed to the lender. What are Investment Rates and Are They Important? Interest rates for a conventional mortgage will depend on the length of the loan, its size, current economic / financial market conditions, and whether or not the loan is a fixed-rate or adjustable-rate. There are also points, i.e. fees, that are associated with the interest rate. The more points you pay, the lower your interest rate. Understanding your interest and investment rate is vital to determining, not only your investment strategy, but the money you will owe on a monthly basis. If you pay too much for the loan, then your debt to income ratio will be too high and you’ll likely not have the capital needed to get another loan (or investment property). What documentation is required for a specialty loan for someone who is self-employed? A self-employed individual will have to show extensive documentation in order to qualify for the lower interest specialty loan. For debt to income ratio, is it by gross income or after tax income? Debt to income ratio is calculated by how the individual has paid. Sometimes income can be “grossed up;” however, for a straight W2 it is calculated by gross. For investment purposes, is it better to go for a lower interest rate by paying 25% down, or pay only 20% down and save that money for another investment property? The answer to this question will depend on your investment strategy. However, from a math standpoint it is typically to your benefit to take the 20 percent down option. How can I use IRA value to help qualify for a conventional loan? The IRA has to have a regular distribution (that you actually take). Let’s say that you need an extra $1,000 a month to qualify, and you have 36 months of that value in the IRA, then you qualify. How do you approach loans under LLC structure? Conventional financing is a bit of a challenge for LLCs. However, this challenge does not apply to specialty loans and other types of mortgages. To understand how it should be approached, you should speak with your investing consultant and real estate attorney. If you have a HELOC, but are not using the balance does that count against you for your Debt to Income Ratio? The short answer is no. However, it will count as one of the 10 golden tickets since there is still a lien recorded against the property. In conclusion, with the help of your real estate attorney, CPA, and investing consultant you can best determine if a conventional loan, specialty loan, or other type of mortgage offers the best financial solution for your unique goals and needs. The differences between a conventional and specialty loan are constantly being revised, which is why you should always complete your due diligence before financing a new real estate investment property. Want more real estate education?! Become a Member of Real Wealth Network! Kate previously worked part-time for RWN back in 2012 and rejoined our marketing team in 2018. She assists with research, content creation and SEO for our website. Kate has a diverse background in marketing and education, with a bachelors degree in Communications and a Masters in Education. She's worked in digital marketing for 7+ years and taught high school for 3 years. 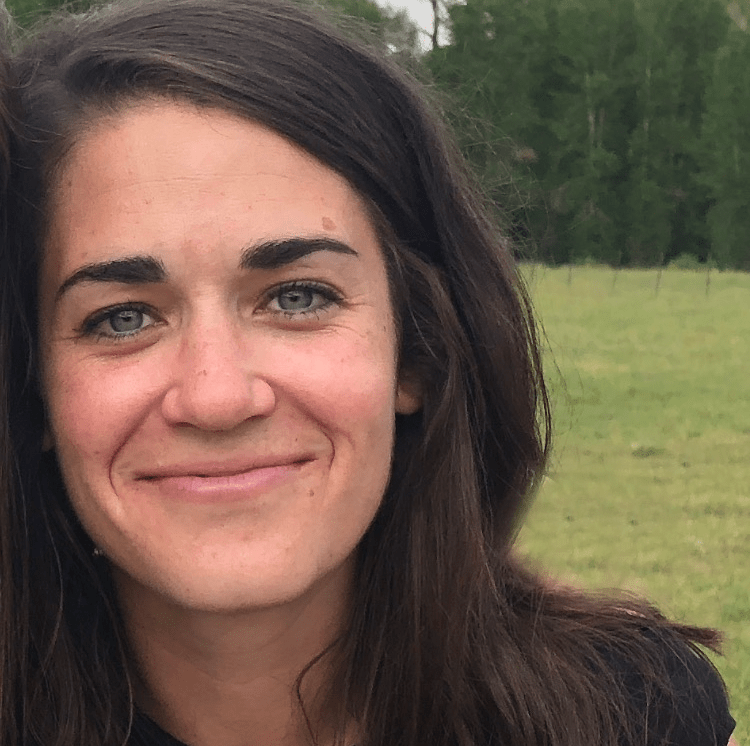 Kate lives in Salt Lake City and enjoys skiing, golfing, hiking with her two Airedale Terriers, and going to Utah Jazz games.